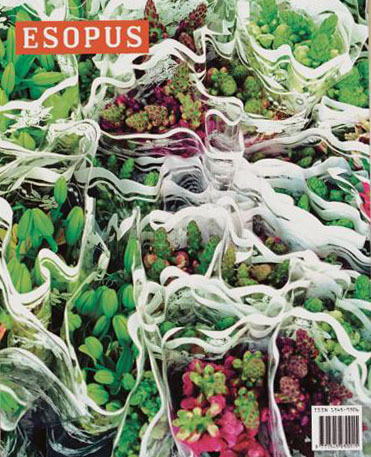 Esopus is published biannually in New York, NY. Named after a tributary of the Hudson River, Esopus (and the Esopus Foundation) is a labor of love run almost entirely by Tod Lippy. Each issue is full of interesting articles, design, and material. The magazine is very well designed. Each article is treated differently and special paper is often used to enhance the quality of letters and photographs. This quality of touch and feel gives the reader an experience of discovery, something often lost when things are reprinted. Even the website is participatory, as the viewer can thumb through a file cabinet, and turn the pages of a magazine. Esopus was also the recipient of The Specific Object Publication of the Year Award for 2007. You can purchase issues of Esopus magazine at your favorite independent bookstore or order a subscription – two jam packed issues for only $18!